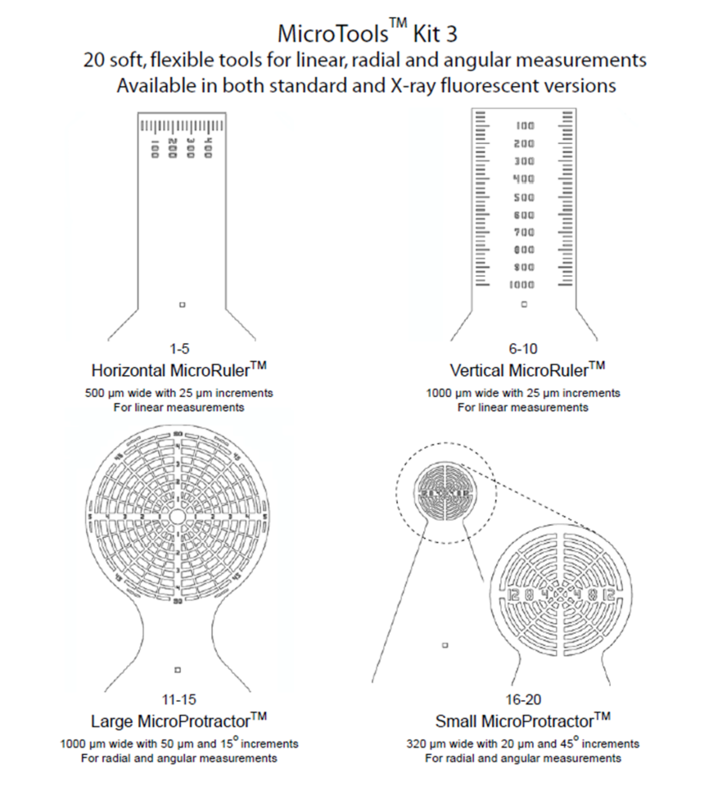 MicroTool™ Kit 3 contains 20 tools for sample measurements. Two tool designs allow measurement of linear sample dimensions, and two allow measurement of both linear and angular dimensions. Use them to accurately measure small and fragile samples with minimal chance of sample damage. The tool tips are 10 micrometers thick and are both optically and X-ray transparent. Each tool is mounted on a 25 mm pen. Each tool is mounted on a 0.025"/ 0.64 mm diameter nonmagnetic solid stainless steel rod. Hold them in a standard 0.7 mm mechanical pencil (included with each kit), or in a micromanipulator. Click the button below to add the MicroTools Kit #3 to your wish list.